Peanut butter and jelly. Peaches and cream. Marky Mark and the Funky Bunch. So many classic pairings out there, they just deserve to go together. Such as it is with Trader Joe's Sweet Potato Tortilla Chips and Trader Josè's Chunky Spicy Guacamole Autèntico that we're gonna review them both right here and now. If you've listened to the first episode of Let's Talk TJ's, our brand-spankin' new podcast, you mighta known this review was comin', but there's some ground to cover, so let's get to it. First: Trader Joe's Sweet Potato Tortilla Chips. This isn't their first go around with a yam-inspired tortilla chip, but it's a little different from previous incarnations. TJ's has had a longstanding product in an orange bag that has somehow escaped the scrutiny of this blog despite repeated pick-ups from me, at least. Those, while good, were a lot like typical corn tortilla chips - heavy on the maize aspect, with just enough sweet potato to turn them that requisite rustic hue and offer a little hint of taste. Not bad, right, but kinda "meh" after a while. This is a whole other something else. These chips smell more sweet potato-ey. They taste more sweet potato-ey. 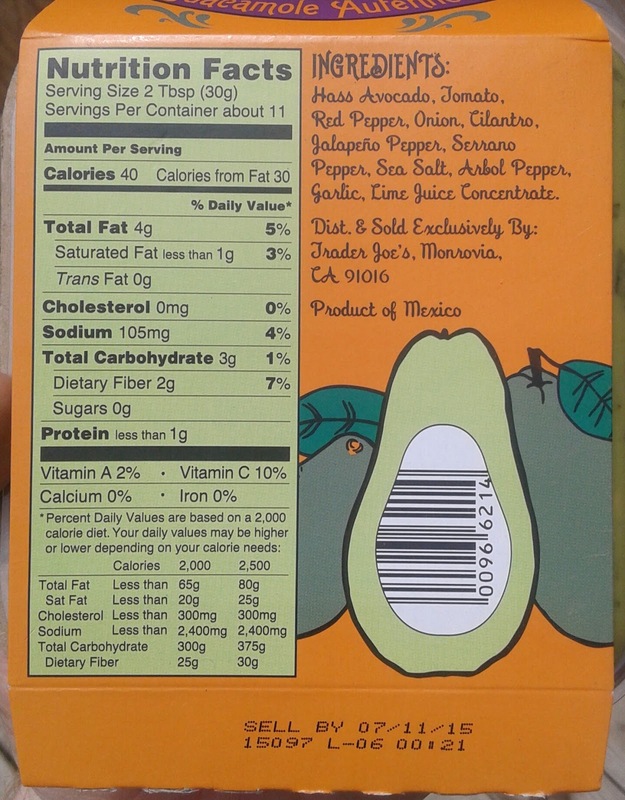 And they, by design, are in fact more sweet potato-ey - 18%, to be exact, according to the blurb on the back. That doesn't sound like a lot, but apparently that's the most amount of sweet potato flour one can mix with corn and still get something resembling a tortilla chip and not some mess. 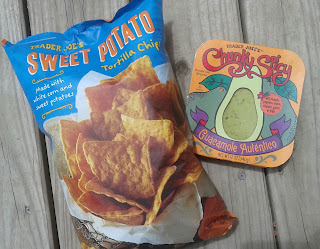 There's still a fair amount of typical corn chippiness for the flavor, but I'd say the sweet potato flavor dominates. These chips are lighter and crispier as well, while not being overly greasy, and fairly lightly salted with a little touch of lime. The ingredients also list "honey granules" which I presume are meant to enhance the sweetness of each chip (well, duh), but there's nothing that seems forced about that, either. These are some darn good chips. Bonus points for being gluten-free. Of course, nothing makes a good chip even better like something worthwhile to dip it in. 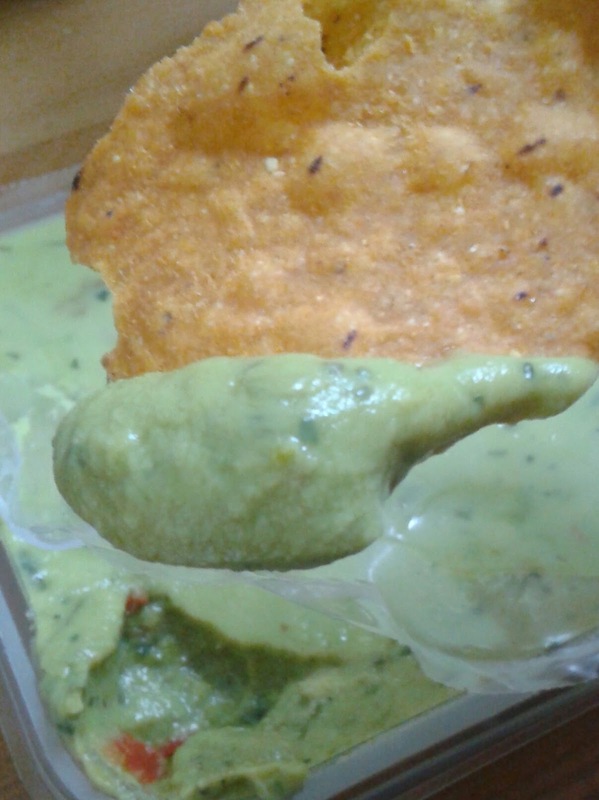 So glad to have spotted Trader Josè's Chunky Spicy Guacamole Autèntico for the snacky sidekick. I haven't tried that avocado salsa yet, but I can tell you this is on the completely other end of the texture spectrum already. In the package I bought, there where probably at least half a dozen big, soft, creamy chunks of avocado that were multi-chip worthy. Love it. In between them were some small chunks of pepper and onion (nothing too noteworthy) with plenty of smushed avocado that was again very soft and creamy. I honestly didn't consider this to be too spicy, but others might - there is a little tingle from some jalapenos and black pepper, bt that's about it. Some bites tasted a little salty, though. Looking at the ingredients, there's nothing weird in there, nothing out of line - just good, honest guacamole that tries to replicate homemade as best as possible. I don't think I could make a better one myself. One quibble: the packaging. It's the curse of avocados. No one else in my house likes them, and I can't (and by that, I mean shouldn't) eat one of these in one setting, or even over the course of just two or three days. But it's a cheap, flimsy, peel the plastic back thing which I covered up as best I could with Saran Wrap and a Ziploc bag, and it still got brown around the edges. Listen: If literally right down the road from me people are working on driverless cars for Uber, we can find a way to keep guacamole fresh for more than a day. Together....delicious, delicious snacking. I bought both the sweet potato tortilla chips and chunky guac two shopping trips in a row, and will continue to do so until I get sick of them, which I hope will not be for a long, long time. The slightly more fragile composition of the chips caused a fair amount of breakage while digging through the avocado chunk minefield, but with a little care, the damage was kept to a minimum. At present time, I can't think of a better chip-and-dip pairing. Sandy wholeheartedly enjoyed the chips just plain or with some ranch on them, so these will be around pretty often, I think. As for the guacamole, I couldn't pay her to touch it, which isn't a bad thing - there's more for me! Too much textural funky stuff for her. For only like $3 each, they're both steals. Let's 9 them both up. There are a couple of little tricks to keeping your guac fresh. Neither involve the original container. You will need the smallest sealable container you have and a spatula. Take your spatula and scrape all the avacado goodness into the smaller container. Use the spatula and a tap or two on the counter to level the surface and get rid of air bubbles. For the next step, you have a choice of either lime juice or water (or even half and half, it doesn't really matter). You will need enough of your liquid of choice for a layer about 1/4 inch above the surface of the guacamole. Don't worry if it looks a bit cloudy at first, it will settle. DO NOT shake or stir. Cover the container and refrigerate. When you're ready to snack again, simply pour the liquid off the top, give the guac a quick stir and you're ready to go. Using lime juice will make the guacamole tarter, but that isn't necessarily a bad thing. 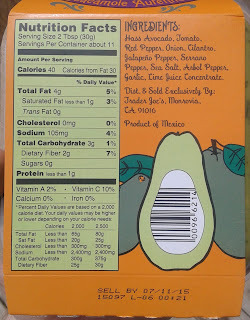 I noticed that the guac is from Mexico "product of Mexico". It is interesting that Trader Joe's would use the product from the actual orgins. Like naan: product of India. It is great that they are using international products to deliver better tasting foods while keep it low. The easiest way I've ever found to keep avocado fresh is to freeze it. I just mash up a Haas avocado with lime or lemon juice, put half in a ziplock like sandwich bag, flatten it out, and freeze. Once it's hard, it's quite stackable. But it thaws quickly enough that way. You also can freeze much larger amounts in bigger bags, but I just want half an avocado at a time. So I buy them when they're cheap and freeze this way. You also can freeze halves of avocado, but don't know how well that works. Don't add anything but the citrus juice before freezing, though- things like tomato don't work well, add them after thawing. Guilty as I felt for buying vs making guac, this was superb, esp. on the chile lime chicken burgers.